If you email us to place an order, please make sure that your spam filters will allow us to write you back! You must set your filters to allow "orders@dandylionrecords.com" through. Extremely limited; this was never issued on cd or LP! We got them direct from the band. Please see the photos above for track listings - these songs are exclusive to this release!!! 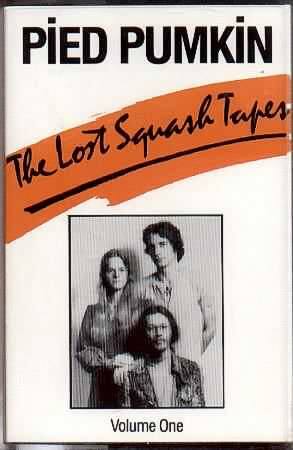 Squash 1976. This is a cassette tape, NOT a CD! CR02 tape. We've had this in stock sitting for awhile while I tried to figure just how to explain to you how great this band (which you've probably never heard) is! Featuring Shari Ulrich on violin & vocals, Rick Scott on dulcimer, vocals & much of the song writing & Joe Mock on guitar, vocals & song writing, The Pumkin would have been right at home in 1960's San Francisco. Instead, they came at the the tail end of the Canadian progressive folk movement that also brought artists like Ian Tamblyn, Bruce Cockburn & David Wiffen. Ok, here's that attempt at a description: they combined a bit of the San Francisco hippy ethic & The UK silly folk ethic (Fairport Convention & friends) with some great song writing & playing (Shari is pretty much a virtuoso on violin), & a wonderful sense of humor. Throw in some tremendous harmonies and finally, add to that Rick's unique musical persona which could perhaps be described as being a bit similar to the Tubes Fee Waybill without Fee's dark side. What I can tell you is all 4 of their albums (especially the first 2 with Shari) were on my stereo constantly in the late 70's - mid 80's. If you're into well played, touching acoustic music with an innocence & great sense of humor, these all come highly recommended. We are currently offering this rarities tape & Shari's first & third solo album. None of these have ever been on cd.